Why Must Resellers Approach E-commerce Strategy Differently? Over the last decade or so, there are only a handful of office products (and virtually no business equipment) resellers who have developed successful e-commerce revenue streams. Despite the decline in North American reseller numbers during this time frame, thousands still remain and, of the hundreds of those that have tried to develop an e-commerce business, most have outright failed to do so. When casting an eye at the OEMs, at Office Depot, Staples, and, of course, at Amazon, it all seems so simple. Between them, they are transacting billions of e-commerce dollars which, from an outsiders viewpoint, must seem to be such a simple process. So, why can't the office products and business equipment independents get any traction with their e-commerce initiatives? The technical challenge to put up an online catalog for conducting e-commerce for small business is not, by any means, insurmountable. So, let's just assume for a moment that, both from a technology and a depth of product line perspective, smaller resellers are able to put up an equivalent e-commerce offering to those deployed by the big guys. If this is the case (and we think it is) then it can't be a lack of technology or a narrow product selection (catalog) that's preventing smaller independents from being successful. The table below has been prepared to help explain the problem facing independent office products resellers and e-commerce initiatives. As it turns out, the core issue is a lack of domain authority, a simple problem to identify but not so simple to address! Just compare Big-Box domain authority with that of an independent OP/OE reseller - 87 Vs. 22! Bottom line, even if reseller websites were fully optimized for SEO (which is rarely the case) and carefully built around popular keywords (i.e. "Office Supplies"), then the sites still don't rank well for these search terms because their domain authority is so weak compared to that of well established online competitors. An independent resellers website will typically rank at 100+ for popular keywords (meaning they will appear sometime after the 10th page of the search results) and, as we all know, no one clicks through 10 pages looking for an acceptable result! Unfortunately, the dilemma is, without the reseller organically ranking for searches on popular keywords, there's no way to generate the necessary number of site visits required to successfully develop a business using the B2C approach historically taken. Furthermore, even setting the required domain authority issue to one side for a moment, the costs associated with using paid keyword search for developing web traffic means it's not a viable option for the vast majority of resellers. The second problem is pricing. Look closely at the "Online Reseller" channel - the average price on the cartridge example we chose is $17.49, whereas the average price in the OP/OE channel is $59.99. Regardless of whether or not a reseller can improve its site domain authority to 50+ in order to achieve a better ranking on popular keyword search, it still won't develop a B2C e-commerce business using its current pricing structure. Please click this link for a related article that explains why we focus on aftermarket office supplies as the vehicle for increasing OP & OE resellers market share. Even if a dual pricing strategy can be successfully managed, the reseller must still overcome the major hurdle of increasing its web traffic from 10 UDVs to 3,000 or more. Of course, with the current approach, this is very unlikely to happen. It would take considerable expertise. The effort must be funded. Funded that is, while offering a product at a 70% discount to current pricing! Resellers who aspire to develop a successful B2C e-commerce business must accept the pricing rules, must increase their domain authority, and must develop web traffic with all the associated costs and time frames that come hand-in-hand with that project! The proceeding data table has laid out the cold, hard facts and those facts are not going to change! Because of these facts, the mindset for the initial conversion currency for independent resellers must be changed from dollars to leads. This means the time horizon for the selling cycle must be extended to account for those leads having to be worked through the sales funnel until a portion of them are eventually converted to customers. Trying to accomplish a goal to win new customers online, while ignoring the longer selling cycle associated with converting to a "visit-to-lead" versus a "visit-to-sale" strategy, is doomed to fail! The traffic heading to the popular e-commerce sites is far more likely to have an "intent-to-buy" motive. However, as we've explained, smaller independent resellers are simply unable to win this traffic because of the huge cost incurred to compete for it. Furthermore, if this tactic is deployed by a reseller attempting to boost an e-commerce business, it results in a high cost of customer acquisition and, when combined with the typical persona of the conversions and the lower likelihood of them ever becoming loyal, long-term customers, that high cost of acquisition will not payback. These two factors (high CAC and low LTV) combine to ensure a startup "pay-for-traffic" strategy fails. Fortunately, most independent office products and equipment resellers are not investing into the potential sinkhole of paid-traffic strategies to convert surfers, at the "intent-to-buy" stage of the buying cycle, into customers. First, most don't have the level of know-how required to execute a paid traffic strategy. Second, they don't have the domain authority to rank in searches for popular (high volume) keywords. Third, most don't have the financial resources to pay for enough traffic to make a difference. Fourth, the resulting ratio between CAC and LTV would mean the investment would never be paid back. 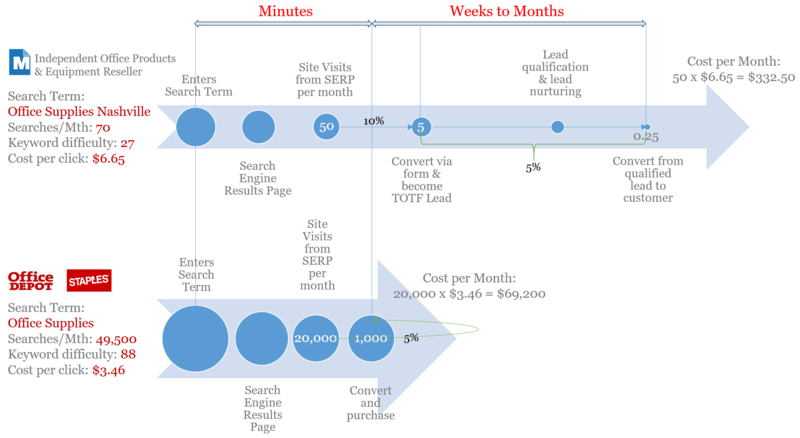 What's required for a "top-of-the-funnel" lead development strategy? For resellers who understand the necessity for developing "top-of-the-funnel" sales leads, and who deploy strategies to attract relevant inbound web traffic, they must (as one component of their content) make their product offering and list prices easily accessible. This means showing a catalog of products, availability, and pricing without forcing visitors to have to wait for a "new-customer-registration" process to be approved. Restricting access is far more likely to generate a "bounce" instead of allowing for the potential of a well qualified prospect converting to become a lead! Pricing for an online B2C initiative will be much lower than their current B2B prices and this will create a major conflict with existing customers. The pricing for a B2B initiative will be much higher than "internet" pricing so no one will ever engage simply because published prices are not competitive. Resellers seem to fear that, by not having the the most competitive internet prices, they will get no web traffic. This fear may be justified so far as the "bottom-feeding-immediate-intent-to-buy" surfers are concerned but ultimately, as we've explained, this category of traffic is going to find the cheapest price anyway, and is unlikely to have an acceptable LTV profile. What most resellers don't seem to get is, that it's OK for the random "bottom-feeders" to either never arrive at their site, or, if they do, to bounce right out of it. This isn't traffic that should be targeted and, as we've already established, independent resellers cannot effectively compete for it anyway. However tempted resellers may be to push for a quick result, they must let that traffic, and any of the potential business it could bring, go straight to Amazon and the other established B2C e-tailers! Look at the Big-Box channel and its published internet pricing compared to that available on Amazon and Google. Depot and Staples, who make up a big part of "Big-Box" are absolutely NOT the cheapest guys on the internet, yet they have massive traffic volumes and substantial e-commerce sales. Office Depot and Staples don't offer the lowest internet prices but that doesn't mean they're shy about displaying prices! Instead, they rely on their brand authority and their value proposition to win customers! So, where's the market opportunity? Historically, the independent resellers failure to develop e-commerce is strongly associated with the direction they've taken. Cast your eye again to the data table (below) and look at the "Market Void" column. Instead of taking the futile path on the left toward an online B2C initiative, resellers must switch direction and attempt to develop an online B2B channel. Look closely at the Big-Box B2B/B2C channel. Look at the web traffic (350,000 UDVs), the domain authority (87), the ASP on aftermarket cartridges at 75% of the OEM price. If Big-Box can be successful with these metrics then that's what independent resellers must emulate in order to profitably grow their businesses. Working to develop their DA to 55, their UDVs to 150, setting their aftermarket cartridge pricing to a 50% discount compared to the OEM and a 33% discount to a comparable aftermarket product through Big-Box, and the model starts to work. 150 UDVs equates to 4,500 visits per month. 2.5% conversion equals 112 leads and 5% conversion of leads to customers eventually results in 5 new customers! Is there a role for paid traffic? We're not saying there's no place at all for a "paid-traffic" strategy. Indeed, this can be very accretive when deployed for the purposes of extending a resellers reach, developing brand awareness, and expanding its sphere of influence. However, these paid efforts should also be targeted at "top-of-funnel" sales leads rather than mistakenly trying to seek out transient buyers who, though they may well have an immediate "purchase decision intent", are surfing for the best prices available on any given day. Purchasers with "bottom-feeding" habits will most likely be doing the same on subsequent purchases so, the chances of winning a loyal customer, are low. The ONLY way the strategy we've explained will work is when it's "content" driven! In order for a B2B initiative to work, the reseller must create content (in addition to its product catalog) to execute a successful inbound strategy. Remember, this strategy requires targeting "top-of-the-funnel" sales leads and this means targeting visitors who are not at the decision stage of the buying cycle. This strategy means deploying content that has been created to educate visitors and to build trust. The approach is quite deliberate but the consequence is that it doesn't result in an immediate sale. Instead, as we've explained, it requires a longer selling cycle to allow for the time required to work on developing brand awareness and trust in the value proposition. The objective is that when the lead has reached its decision stage in the buying cycle the marketer has successfully positioned its business to benefit from that decision. One of the many consequences of this strategy is that different content has to be created that can be effectively targeted at different personas at different stages of the buying cycle. This content must be delivered by way of blogging, social media, and clever, direct email marketing strategies. While it may be convenient to think (hope) it's possible to open up an online store and then sit back and wait for the orders to start flowing in, it's simply never going to happen. Furthermore, there's something far more fundamental taking place here and that's the matter of business survival. The thing is that, in order to survive, more and more businesses are being forced to upgrade their capabilities and to improve their value proposition. Those that don't (and this includes office products and office equipment resellers) face ever increasing churn (loss) on their customer base and are eventually destined to go out of business. It's really not just a question of figuring out how to start doing e-commerce, it's about improving the value proposition, embracing technology, making it possible for customers to seamlessly do business, and to fill a sales pipeline with qualified leads to help develop an office products growth opportunity, profitably increase revenues, and increase market share. As an office products & equipment reseller, are you still operating in the analog world or are you transitioning to digital with the use of sophisticated digital marketing tactics? You can't survive unless you do, so please check out our SlideShare "executive" summary to help you determine where you are in the process! To improve the future for office supplies dealerships, their websites must become the foundation for digital transformation. As OP or OE resellers, why not check out our free, no obligation, offer for a comprehensive evaluation of your site? Just click the button below.